You already know about spiritual salvation, but what about the other two kinds of "salvation" in the Bible that will be available and critical in the end time? One kind you will definitely need when it is offered, the other I'm sure you will at least want when you hear about, if not absolutely need. What are these other "salvations," why do Christians overlook them and how do you make sure you receive them when they are available soon? "Are You Saved?" - Which Kind of Salvation? 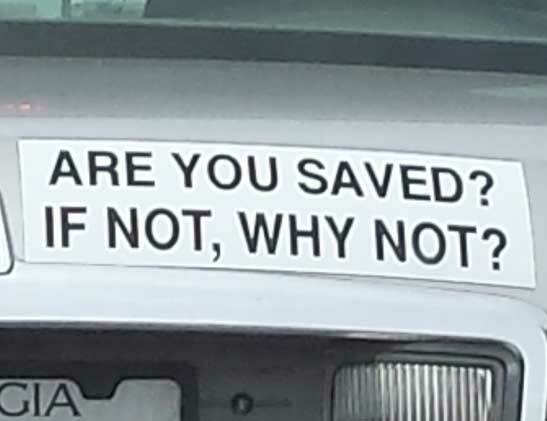 The picture above shows a bumper sticker with the ubiquitous Christian question, "are you saved?" It is intended for the unsaved (non-Christians), of course. However, Christians in the end times will be learning that this question applies to them as well, in two exciting and major new ways. That's right, there are three types of salvation and they will all to be offered widely and with new or supernatural power in the end times. Christians are mainly familiar with the first kind referred to on the bumper sticker: the need of salvation for your soul, or spiritual salvation required to receive eternal life. The other kinds are less common today but are going to be important or available soon in the end times. I'm speaking about not just spiritual salvation but also being delivered and healed physically. 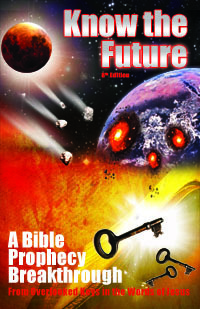 All three forms of salvation are represented in end time prophecy. Interestingly, all can even have the same underlying Greek word behind their English translation in the NT: sozo. Today the norm is to only be spiritually saved and have no experience with God's healing or his deliverance. That will change as we enter the end. But what is surprising to most is how in the end time you will be able acquire healing or deliverance from God without being spiritually saved. Further, what you will definitely want in the end time is experience with all three, lacking none. Confused? Stick with me and you'll understand why soon, and how to make sure you don't miss out. The second type of salvation can be illustrated best by the prophet Joel. Joel 2:32 — And everyone who calls on the name of the Lord will be saved. Paul leverages this verse to argue that salvation #1 will be available to all, not just the Jews but also the Gentiles (Rom 10:12-13). Yet if you look at the context his quote from Joel, you will be surprised to see that it is talking about another form of "salvation:"
Joel 2:30-32 — 30 I will show wonders in the heavens and on the earth, blood and fire and billows of smoke. 31 The sun will be turned to darkness and the moon to blood before the coming of the great and dreadful day of the Lord. 32 And everyone who calls on the name of the Lord will be saved; for on Mount Zion and in Jerusalem there will be deliverance, as the Lord has said, even among the survivors whom the Lord calls. There it is. Joel describes being "saved" in the form of "deliverance" from some unclear threat from space (heralded by a blood moon) so that you are among the "survivors" who make it alive. It's salvation from physical death; salvation #2. What is the source of this threat? The parallel prophecy to Joel in Revelation 6-8 answers that. There we learn that the simultaneous solar and lunar eclipses and other disturbances including a great global earthquake and meteorites pelting the entire earth are caused by a planetoid called Wormwood. Jesus called this event the "beginning of sorrows" (Mt 24:8) because the global cataclysm kicks off the end time sorrows leading up to his return. The other sorrows you are already familiar with as the Great Tribulation (Rev 9-11) and the wrath of God (Rev 15-16, 19). As I have written on extensively earlier in my book and my articles, God is going to set up this place of deliverance that Joel 2:32 locates at the Mt. Zion/Jerusalem area. He will do it by "calling" people there, just as it says. The problem is, this type of salvation will require faith just like spiritual salvation does. The place of safety won't be anywhere you want to go to. Nor will it seem at the moment your home country is a worse place. It will appear perfectly fine to stay put right where you are. Not Everyone at the Place of Safety Is "Saved"
When I say it takes "faith" to get to the safe place, Christians focused on salvation #1 often overlook something about the spiritual state of the people in the safe place. This comment asks a common question among Christians in the pretrib rapture mindset. If God's wrath kills everyone with the mark of the beast after everyone else is raptured, then who are the "mortals" left for us raptured, glorified saints to rule in the Millennium? Marked survivors of God's wrath who Jesus "unmarks" — This one is both surprising and provocative as I have explained earlier. Mark-free people from the place of safety who were not raptured for two possible reasons. What are the two possible reasons? The first reason someone at the place prepared might not get raptured is because they are simply not old enough. They have not reached the age of accountability yet. I delve into that interesting situation in this article. The second reason is because not everyone who makes it to the place of safety will be "saved" or have (spiritual) salvation #1. How can this be that not everyone at the place of safety is saved if it takes faith to get to the safe place and faith to receive eternal life? Simple. They won't need faith in God's goodness or his word (Heb 11:6, Lk 8:21) to make it to safety. They will have many other reasons to have faith in that can drive them there instead. If you think about it it's a lot like at church where not everyone who attends church is saved nor are they going for the ideal reason. People go to church for many reasons. Young children go because their parents make them. Adult children tend to go where their parents go out of habit or familiarity. Other adults go to church for social aspects. Some go to find dates; others for networking. Still others go for the music or inspiring messages. Only a small percentage attends church primarily because they love God with their whole heart (Dt 6:4) and want to obey what they think he requires of him. Similarly, the place of safety will be filled with a mix of people who are not there for different reasons and not everyone for the best reason. That's OK because the majority will be people who have learned and practiced the true gospel. For the minority, once they get there for their non-ideal reasons, the positive peer pressure from the majority will help to get them on the right path. If that does not work on all, then the sudden death of those who are wolves in sheeps' clothing there (like happened with Ananias and Sapphira - Acts 5:3-5) will get those who are on the fence about God being worthy of worship to stand up and take it seriously. That said, I expect there to be some in the group who loved their life enough to take a chance on the salvation offered, but hold out on repentance. They may get along with the group fine with the "live and let live motto" but will want to "do their own thing" or in other words, remain a god unto themselves. Along with those below the age of accountability they make up those in the place of safety who won't be raptured and instead are ruled in the Kingdom by us. Unlike the children of the glorified, they won't be princes and princesses in the new kingdom (Rev 20:6). What a great parent you are to want an autistic child to live when you have the chance to let him go to heaven. You prefer the burden to release from the burden like a lot of parents want. ... With WWIII so near as well as the Earth Changes the Russians say will be in late 2019 and 2020, Yahveh may think it best to take Zach rather than for him to be unable to cope with what is coming. This person spoke an uncomfortable truth in their compliment. Yes, some might pray for God to "take him to heaven where there is no more suffering." Yes, sometimes God does end suffering or prevent suffering on the righteous that way (Isa 57:1). However, this person was overlooking what all of us can expect and count on in the end times. As explained already above, God has a plan to save us all from Wormwood (or the "earth changes," as they are called by this person). It's not a very good plan if God's too weak to accommodate special families with special needs! Wheelchairs, assistance, money, whatever we need. More importantly, people with special needs, just as anyone dependent on medications, will be freed from these shackles of illness. Just think about it on the medication aspect alone. How will anyone be able to cope in God's place of safety without "my meds" unless God gives them the gift of health (Ps 103:3)? In the Western world, a large and growing percentage of the population is medicated. It's uncommon to encounter an elderly person who is not on at least one medication. Clearly God has to do something about this if he is going to remove us from civilization for our deliverance. I feel it is safe to expect powerful, complete healing to solve these problem situations. The reason I conclude this is because that type of healing accompanied the preaching of the Gospel of the Kingdom at the hands of Jesus and those he sent out and the apostles after he left the earth. That gospel which Jesus taught is returning again (Mt 24:14). When it does, powerful healings should return again, too. The other reason I conclude this is that the last time God lead a people on a mass migration like this he did similarly. During the Exodus, Moses led out poor, abused slaves. They could not have had a lot of energy, nor perfect health. Yet they walked out of Egypt and around the desert for 40 years. The indication is that they were supernaturally helped in their walking. It not only says that their shoes did not wear out (Dt 8:4; 29:5), but also that there "was no feeble/stumbling among them" (Ps 105:37 KJV). This points to supernatural strengthening to me. Admittedly, I can't point to an Scripture explicitly stating that healing is coming in the end time. But if we're going to be lead out to where God says to go like the Israelites were, I think God has to take care of the health and all of the ailments of his people for such a journey. Otherwise, too many won't make it. Otherwise, God's plan is not very good! My advice is to not be like the person quoted above and remember God's "benefit" of healing (Ps 103:3) along with his benefit of salvation/forgiveness of sins (Ps 103:3). Be expecting healing to be available and do not doubt it when you hear of it at the same time the Gospel returns. Seek it out and grab hold of your healing. Get all three salvations: Get your healing for health, along with your deliverance from death and make sure you understand and "obey" the true gospel of the kingdom so that you are saved and don't hear "depart from me I never knew you." Get all three for the perfect and complete salvation in the end times. When Elijah comes, expect these three salvations to follow. So be on the lookout. Update May 31, 2018 - While I still cannot show you any end time prophecy directly promising healing for those God delivers in Judea, I do have dream confirmation now. It came after asking God in prayer to give confirmation of my thinking that a "fountain of youth" level of healing is coming. Check out the dream here. I would liketo thank you for clarifying the doubts that i had. From what i was told before i didn’t know how to discern between the types of salvation. And yes, i used to believe that there was a pretrib but i got my eyes opened later and i thank God for this. Tim, I’m sorry you and Katrina had to experience such an unwise mail, as you both have stood in great faith for your son’s healing and all that has cost you. We should always believe God for healing since Jesus bore many stripes for our healing on the way to the cross. I commend you for being a shining example to those who follow your ministry and who are looking on. We never know who is watching and it behooves us to live our faith well. I’m continuing in prayer for Zach and will until we hear he has returned to normal. God be praised for this wonderful healing for him and your family in Jesus powerful name. It’s funny, I was talking with my wife about this very subject a few days ago. She takes medicine for high blood pressure, low thyroid and restless leg syndrome. She asked me “how am I going to go without my pills?” My answer was pretty much what your article stated above, that I think God will take care of all her needs and not to worry. Also, my 29 year old stepson has schizophrenia and a learning disability. I can’t wait for his mind to be healed completely. I often tell my husband about the articles I read on here and the things I’ve learned while reading them. He has lots of doubts (but hasn’t gone to the trouble of looking for himself). When I would talk about the place of safety, he would kind of go into a “You need to get into better shape if we’re going into some foreign wilderness” speech. I understand where its coming from, but I knew in my heart Yehovah would heal me for such a journey. He’s a personal trainer by occupation, so his mind is a physical one. However, this just confirms what I knew already in my heart to be true. I can share this with him and maybe he can set aside some of his worries over my health. Your insight on the healings/salvations certainly brought much hope to me as well… I have 5 hernias 3 ulcers in my stomach.